*New* Print a condensed copy of this housekeeping schedule for your fridge or home-maintenance binder. Click here to view and download your free printable. Good house keeping starts with a good cleaning schedule, and there’s nothing like walking into a house that smells as good as it looks. When floors are washed, beds are made and dishes are put away, the family gains a sense of comfort in knowing that their surroundings are under control. Being clean and organized saves you both time and money. When all things are put in proper order you don’t have to spend minutes or hours looking for lost items. And when supplies are carefully organized, you can easily find them instead of replenishing stock. That’s where a schedule like this comes in handy! 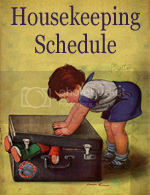 This schedule focuses on house cleaning. It does not cover meal planning, bill payment or personal hygiene. It is designed to get your house in tip-top shape each week and keep it looking that way. Tackle one area of your house/day, and before you know it you’ll have it sparkling clean from top to bottom! If you’re starting from scratch, then the first week or two will take up much of your time, because there may be areas that you haven’t been cleaning on regular basis. But once you get a good deep cleaning done, up-keep will be a breeze! My sister Betty always says, when the dishes and laundry are done a woman is happy, but that happiness dissipates quickly if we don’t make a daily effort to keep up those areas. Dishes and laundry are constantly in use, and therefore we must constantly be on top of those kinds of jobs. This “Daily Upkeep” section of the schedule covers the cleaning that you’ll need to tend to each and every day. It only takes five minutes to make a bed. Five minutes goes a long way to making your family appreciate you. If your children are old enough, ensure that they make their own beds before school. Caring for the house is a great habit for all kids to get into. 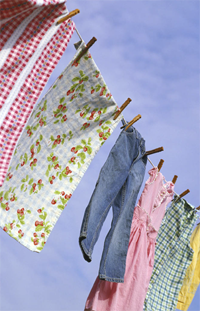 Depending on the size of your family, you may need to schedule anywhere from one to four loads of laundry/day. Start with two loads each day (Monday-Friday) and decide if you need to increase that number or not. While the water is running in the machine, wet a light-colored rag and wipe down the washer and dryer if necessary (keep a few on hand in that room). Throw the rag into the load. Set a timer so you don’t forget to put the second load in. The timer is also necessary for clothes that are drying. Whether they are in an electric dryer or hanging on the line, we want to fold them as soon as possible to prevent wrinkles. And besides that—fresh laundry smells incredible! Once they are folded, put everything away. Piles of laundry littering the couch only takes away from the hard work you have done. About line drying: I had a clothes line in my last house that ran from the back door to the back lane. 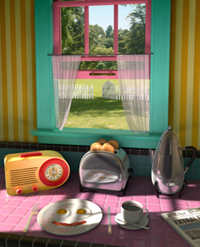 I loved using it in the summer time–felt like I stepped back into the ’60s! Since moving to this house a few years back, we haven’t put up a clothes line yet. However, I do try to dry sheets and towels and blankets on my deck railing when the weather is nice. It’s not the best alternative, but it satisfies my craving for the outdoor smell. While I was in Jamaica I noticed that nearly every house had a clothes line. So when I mentioned it to our tourist guide, she told me that her doctor recommended line drying for good health. Makes sense since the sun offers vitamins and kills germs. If you don’t like the crunchy feeling that you get from hanging up towels and jeans, dry them 3/4 of the time on the line, and finish the load in the dryer. Vinegar in the wash is also a great way to kill odors–even odors as foul as cigarette smoke. Don’t worry about your clothes coming out smelling like pickles, the vinegar smell also washes away in the water and gives the clothes a good cleaning. Empty your dishwasher every night, or put your hand washed dishes away. This clears space up for the next day’s activities. Keep on top of dishes that don’t fit into the dishwasher and wash them as soon as each one is emptied. Pots, pans, plastic bowls and juice jugs can clutter a sink, and a cluttered sink takes the charm away from any dining experience. Find a liquid soap with an aroma that’s pleasing. It will make your dishwashing experience a more pleasurable one and your hands will smell great. Every time you wash the dishes, also take a moment to sweep the kitchen floor. In addition to your daily duties, which I will outline below, set your timer for 10 minutes three times/day and tidy things up. You’ll be surprised at how much you can achieve in only 10 minutes time. I like to do this after breakfast, lunch and supper. This step is in addition to laundry, dishes, and shedding your junk, which we’ll get to next. Everyone’s schedule is different and therefore one routine does not fit all. Choose daily routines that work for you and your family. It could be as simple as listing three cleaning chores for the morning and three more for days end. Don’t overwhelm yourself with enthusiasm or you might tire out. Handle some tasks today, and others tomorrow–it will all get done in time. It may be helpful to start a home maintenance journal where you can record your routine, keep track of this schedule, grocery lists, plan menus and keep track of important “to-dos.” A small three ring binder about the size of a Daytimer works well since the pages are removable. Target carries the cutest little notebooks, and of course I have a few on hand. You can’t insert pages, but if you’re creative you can always glue a little pocket onto the inside front cover to store coupons and grocery lists. Brown paper kraft paper is the perfect weight for book pockets. Cut out a square, fold the edges under on three sides (about 1/3 inch), apply glue for the three edges and fasten to the inside cover. One of the best things I’ve ever purchased was a telephone headset. Mine broke about a year ago, but it’s back on the top of my Christmas list for 2010 [update: I got it!]. Phone calls can be so disruptive when you have dishes to wash, and unless you’re as talented as my friend Sandra, it’s difficult to be juggling both. A hands-free headset is well worth the money if you find that telephone calls are tying you down. I roam the house with mine. The computer is also a huge distraction for women today. Used to be that soap operas distracted women, but as least they were still able to turn up the volume and move freely through the house to get their cleaning done. Not so with computers. Facebook, Twitter, and Blogger are all things that draw my attention away from my home. I need to be cautious that I’m not too sidetracked when there is house work to be done. Sitting in front of a monitor will not result in a clean house, ladies. Clean the bathroom/bathrooms. Wet a cloth and sprinkle soap onto the cloth, wipe down the bathtub, the sink and the counters. I use a hand scrubber to remove tough grime. 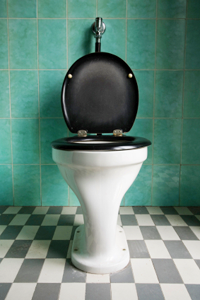 Use one scrubber for the toilet, and a separate one for the sink, bathtub and floors. While my sister was working for a professional cleaning company, she picked up an awesome cleaning tip from them. Instead of using a standard cleaning product, my sisters are now using laundry detergent to clean their bathroom sink and tub. Keep a small box of it handy under the sink (but away from the reach of little children) and sprinkle a bit onto a damp cloth. It works great for removing bathtub scum. Since it’s much cheaper than the standard chemicals I’m switching too! Paper towels are my best friend when it comes to the bathroom. After I wipe and scrub the areas with the hand brush, I dry with paper towels that I can discard. I also like to hang on to worn out socks, or undershirts that I cut into pieces and use as disposable cloths. One pair of long underwear goes a long way! Cleaning your bathtub weekly is important as a ring can build up, making it difficult to remove. Give special attention to the floor. The area behind the toilet is a gathering place for filth, especially if you have little boys. Reach in with a moist hand brush, and wipe dry with paper towels. Keep the soap and brush under the sink where you can easily touch up areas during the week. Clean the mirrors with window cleaner until you can hear them laugh. Then use the moist paper towels to wipe down the door handle and light switch. * See window cleaner recipe below. Look up. Is there a fan that needs to be cleaned? Check your shower liner. Is it time for a wash? Don’t forget to empty the garbage. Next time you’re picking up cleaning supplies, find a box of great smelling fabric softener and throw a sheet into the bathroom garbage to freshen up the scent. It doesn’t have to be brand name, it just has to smell good. 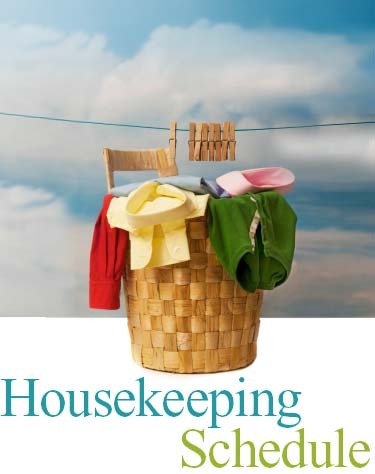 Remember, when guests are sitting on your throne, they have nothing better to do than observe what kind of a housekeeper you are. Spend time in the bedrooms on Tuesdays. Change bedding, and toss sheets in the wash. Note: if you purchase deep sheets, they won’t pop off of the corners as often. If it’s nice outside, try hanging your sheets and blankets outside. Organize clothes, and dust off your dressers. Take a look in your closet to see what you can give away. If it doesn’t fit, or you haven’t worn it in over a year, there is no reason to keep it. Put as much junk away as possible so that all clutter is eliminated. Keep DVDs, CDs, and jewellry off of the dressers. Keep one or two books on each bed stand and put the others away in a book shelf. Clean the windows and mirrors, and occasionally wash your drapes. Wipe down window sills, and clean inside the tracking of sliding windows. They say not to clean your windows on a sunny day, and the reason is that they dry too quickly, leaving you with a streaky finish. Empty space makes for a comfortable bedroom so do your best to shed items when it comes to the most restful place in your home. This is kitchen day. The kitchen is the hub of the family, so in addition to the daily maintenance you do, deep cleaning this room is necessary once a week. Organize your pantry and discard old food. Repackage items that have torn torn or open boxes, and consider storing them in Tupperware to eliminate the threat of insects. Empty and wipe out your refrigerator. Thursday is shopping day and you’ll need all of the space you can get. If you leave this chore to doing once monthly, you’ll find it’s far more difficult to get done. Constant maintenance is the key to keeping a refrigerator clean and functional. Wash your counters and disinfect them. Note: vinegar is a great disinfectant, and since it’s edible it’s a safe alternative to use on kitchen surfaces. A little vanilla on vinyl flooring hides pet odors, but beware of possible stains. Have a coffee maker to rinse? Powdered automatic dish detergent is the best for removing coffee stains whether they are in the pot or on your counter. Just a little bit will do. It also works well to clean a stainless steel sink. Wipe down your appliances and your cupboards. Empty your garbage. And before you put the next bag in, throw about five bags into the bottom of the can. This makes changing the garbage every day an even easier task. It’s a lot easier to pull out a bag when you need masking tape then to sift through a drawer of junk looking for it. It’s also a good idea to designate a shoe box for warranties, instruction booklets, and important receipts. It only takes five minutes to find a shoe box today, but you’ll save yourself all kinds of time and frustration in the future. Once per month clean the inside of your stove. This is grocery day. Plan your meals for a week and write down the supplies you will need. Check to ensure that you have an adequate stock of light bulbs, cleaning supplies, toiletries, and the like. If you have collected any coupons during the week, put them in your purse. Call your husband to see if there is anything that he needs from the store before heading out. If you have errands to run, this is a good day to do them. Save time and gas money by grouping trips together, and try to schedule errands for this day as well . Vacuum all carpeted areas and clean all other floors. Pull the couches away from the walls and get behind there. Every second week, remove the cushions and vacuum the inside of the couch on this day. * Also see carpet cleaning below. Grab a dusting rag or a bounce sheet and dust any surfaces that you haven’t touched yet this week. Clean any windows and mirrors that haven’t been cleaned yet this week. See any scuff marks on your walls? Try using toothpaste to remove them. Several decades ago, my sister Betty decided to jump on her bed with a pencil in hand. When mom discovered the mess she had made, Betty was sent to her room with an old toothbrush and toothpaste. It all came off. Spend time with your family working outside. This is a great day to mow the lawn or shovel the walk, depending on the time of year. In summer, transfer your plants, in winter hang Christmas lights. Check your front door. Does the welcome mat need cleaning? Does your front steps need a shovel or sweeping? Consider what you want done, and use this day to do it. Grab a garbage bag and clean out your car. Vacuuming and cleaning the interior should be done 2-3 times/year, but let’s stick with home maintenance here. Take one day/month to clean out the garage. You may ask your husband to help you if it’s too large a job to take on yourself. If he agrees, spend the time cleaning with him. Take time to enjoy a day of rest with the family. Clean with rag or soft brush. Absorb moisture with a dry cloth. Also works on upholstery, but always test a small area first. Since newer glass is thinner, and therefore dries quicker omit the soap and use vinigar and water. If you would like to have Time-Warp Wife delivered to your inbox each morning, simply enter your email address in the form found in the sidebar.